Rhinebeck, NY, April 28—Sunshine and flowers are especially welcome this year following the extremely harsh winter. The season has finally begun for hiking, gardening, picnicking, and simply enjoying the great outdoors. It is now also tick season—which means increased exposure to the serious infectious diseases they carry. The frigid temperatures did not kill ticks as they have a two-year life cycle and are well regulated to survive winters. They become active once the weather starts to thaw, and by the time it reaches 40 degrees they are seeking warm-blooded hosts to feed on. "According to the New York Department of Health, ticks are most active late spring through mid-August," says Lou Paradise, president and chief of research of Topical BioMedics, Inc., Rhinebeck, NY, the makers of the Topricin line of natural pain relief and healing creams. "Now is the time to avoid contact with them and be aware of the symptoms of Lyme and Babesiosis, two dangerous tick-borne illnesses." The Lyme disease bacterium (Borrelia burgdorfen) is carried by a species of ticks known as Ixodes. Ticks in this group include deer ticks, western black-legged ticks, and black-legged ticks. These tiny terrors are small—typically no larger than a poppy seed—and transmit the bacteria when feeding on warm-blooded hosts, including mice, deer, dogs, and humans. The bacteria enter the skin through the bite during feeding and eventually make their way into the bloodstream. Lyme disease is rampant. According to the U.S. Centers for Disease Control (CDC), the number of Americans diagnosed each year is approximately 300,000, and the agency has gone on record to say that it believes only 10% - 12% of Lyme disease cases are actually reported to them. Most documented cases have occurred in the Northeast, Mid-Atlantic, and Midwest, with some incidences reported from western states, including Oregon and northern California. Moreover, the Companion Animal Parasite Council Parasite Forecast Maps predict Lyme is expanding its range to the west as well as southern states. The NY Dept. of Health reports that in 60 to 70 percent of Lyme disease cases, the first symptom is often a rash that occurs at or near the site of a tick bite and has a round, "bulls-eye" appearance. It can be between 2" and 6" in diameter, and lasts up to five weeks. Other symptoms occur from several days to weeks, months, and even years after a bite. They include "flu-like" symptoms, such as aches and pains in muscles and joints, chills and fever, headache, sore throat, stiff neck, swollen glands, dizziness, and fatigue. Even if these symptoms fade away, untreated Lyme disease may lead to arthritis, nervous system abnormalities, and an irregular heart rhythm. Babesiosis is another infection transmitted by ticks and is caused by a parasite that lives in red blood cells. The babesia microti parasite infects and destroys red blood cells, and the disease—which is a malaria-like illness—can cause hemolytic anemia. Symptoms begin anywhere from five days after a bite or longer, and may include fever, chills, headache, muscle pain, nausea, tiredness, and a rash. Unlike Lyme, Babesiosis has been known to be fatal. Therefore diagnosis and treatment should begin as soon as possible after it is contracted. Because tick bites are usually painless, the incubation period is long, and the symptoms so varied, a tick-borne disease may go unrecognized for weeks or even months. Moreover, these diseases often mimic other conditions—such as the flu, meningitis, or, in some instances Multiple Sclerosis—making it easy for there to be a misdiagnosis. Further complicating matters is the fact that diagnostic tests are not always accurate or conclusive. Test timing is a factor in diagnosis. According to Sally Hojvat, Ph.D., Director of the Division of Microbiology Devices at the FDA's Center for Devices and Radiological Health, "It's important to know that blood tests that check for antibodies to the bacterium that causes Lyme disease are not useful if done soon after a tick bite. It takes two to five weeks for initial antibodies to develop." Avoiding contact with ticks and disease prevention are the first and best lines of defense against tickborne infections. Here are some tips to help keep you and your family safe from these tiny threats. Ticks are carried by deer, mice, and other common woodland creatures.Keep these uninvited guests away by installing a deer fence and moving brush piles and wood piles (where mice find shelter) and bird feeders (a source of food for rodents) away from your house and play areas. There are a number of plants you can cultivate around your yard that repel ticks, including lavender, garlic, pennyroyal, pyrethrum (a type of chrysanthemum), sage, and eucalyptus. Use natural tick repellents. According to award-winning author and green living expert Annie B. Bond, the essential oil of rose geranium is an effective repellent. "Do not apply it directly on skin, but mix a drop or two in an oil, or dab onto your clothing, particularly shoes, socks and pants, shirt cuffs, and collar" says Ms. Bond. "You may also use it on your dog, but again not directly on the skin. Apply a drop to a bandana, or on a collar or harness." Other products she recommends include Rose Geranium Hydrosol, available from Simplers Botanicals for $12.65 (www.simplers.com) and Buzz Away Extreme, which is formulated with citronella, cedarwood, eucalyptus, lemongrass, and peppermint. Studies have found it to be as effective or better than DEET-based products, and it was rated as the most effective natural insect repellent by the Good Housekeeping Institute. It seems that dryer sheets also offer some protection. According to Dr. Gary Wilkes, a veterinarian at Westside Animal Hospital, Augusta, GA, "To avoid ticks, I like to place dryer sheets in my socks, pockets and hat. I don't know if it's the smell or the fragrance, but it seems that loading up on Bounce provides good protection." If your lifestyle permits, raising chickens, ducks and guinea hens will help keep the tick population down as these feathered friends have a voracious appetite for them. Keep your lawn manicured and avoid walking in wooded, brushy, and grassy areas. When hiking in an overgrown or wooded area, try to stay near the center of the trail, and do not sit on stonewalls, which harbor rodents. When outdoors, protect yourself and your children by wearing long sleeves and long pants, preferably in light colors so you can spot a tick more easily.Wear shoes and socks that you tuck pant legs into or a pair of tall boots. After being outdoors, remove clothing and place them in a dryer first for 15 minutes, then wash your clothes and dry again.Washing alone will not kill ticks—even with bleach—it's the heat of the dryer that does the trick. 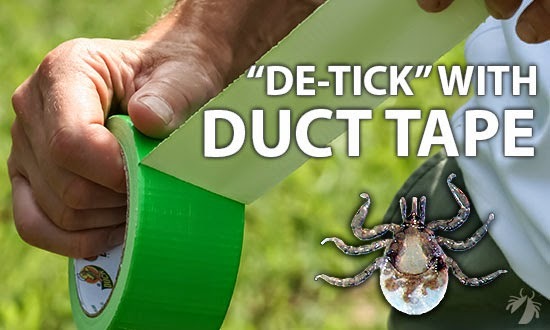 De-tick with duct tape.To get the pests off you or your pet, use sticky duct tape to remove before they bite. Your four-legged friend may pick up an unwanted hitchhiker after being outside.Be sure to inspect dogs for ticks after they've been outside as they may deliver a tick to you, and they can also become sick with Lyme disease. If you discover a tick attached to you, carefully remove it. Using tweezers, grasp it close to the skin and pull straight back without twisting or yanking. There are also devices on the market today that are made for effectively and efficiently removing ticks.Avoid pressing or squeezing the tick's belly as it can push bacteria into your body. Similarly, do not use the heat of a match that you light and blow out, or petroleum jelly.After you've removed the tick, disinfect the bite area.Save the tick for possible identification by a doctor or the local health department. There is now research showing the efficacy of hyperbaric oxygen therapy (HBOT), offering hope to patients crippled by chronic Lyme disease. Dr. William Fife at Texas A & M University has published extensive research demonstrating profound improvements in Lyme disease patients treated with HBOT. These improvements include pain reduction, return of clarity of the mind, and reduction of depression. Doctors will often prescribe antibiotics if they suspect Lyme or another tick-borne illness. Here are some ways you can assist your body further with some safe, natural treatments. "With tick-borne diseases, the body needs to detoxify, especially joint, muscle and nerve tissue," says Paradise. "Applying Topricin is helpful as it gives the body the support for its basic function of maintaining healthy cells and repairing damaged ones through enhanced healing. 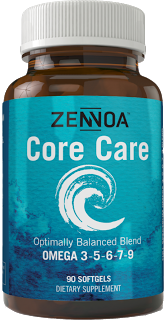 Its combination of natural biomedicines in a clean water-based cream base that's free of chemicals and other irritants helps restore vitality to joint, nerve, and muscle tissues while providing safe, effective pain relief." The reference book Prescription for Nutritional Healing offers the following recommendations for helping to recover from Lyme Disease. --"Green drinks" provide chlorophyll (aids in detoxification while providing important nutrients and enzymes). 20 years in business and a Certified B Corporation, Topical BioMedics is the research and development leader in topical patented natural biomedicines for pain relief. The company's flagship product, Topricin® Pain Relief and Healing Cream, was introduced in 1994 and is now a leading natural therapeutic brand. A combination biomedicine formula, Topricin has been awarded a patent for the treatment of pain associated with fibromyalgia and neuropathy, was listed among the Top 100 Green Products of 2012 by Healthy Holistic Living. The Topricin family of natural healing products also includes Topricin Foot Therapy Cream, specially formulated to treat painful foot and ankle issues and conditions, and Topricin for Children, which received the Parent Tested Parent Approved Seal of Approval (with 5% of sales donated to pediatric cancer foundation). Made in the U.S.A., all Topricin products are federally-regulated over-the-counter medicines with no known side effects, no parabens, petroleum, or other harsh chemicals, no grease, and no odor.